we absolutely love hummus and guacamole. so, we were really excited when we found this healthy recipe which joined chickpeas and avocado together in sandwich format! the combination of the smashed chickpeas and the avocado made for a deliciously creamy salad which was heavenly between two slices of multi-grain bread. the fresh cilantro and the lime juice added just the right amount of zing to the sandwich too. what's better than a yummy sandwich that is healthy for you?! we want to make these sandwiches again and add lettuce, tomato, and sprouts to them too. 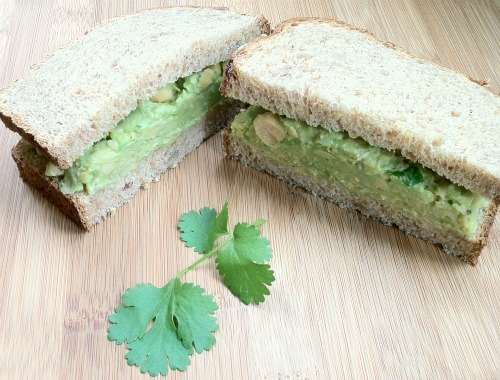 if you enjoy chickpeas and avocado, then this sandwich is a must try! I would have never thought to combine the two!!! That is so creative and yummy! I totally want to try this.